John Evelyn (1620-1706), Diarist and virtuoso. Sitter associated with 13 portraits, Artist associated with 2 portraits. Robert Walker (1599-1658), Painter. Artist associated with 142 portraits, Sitter in 3 portraits. 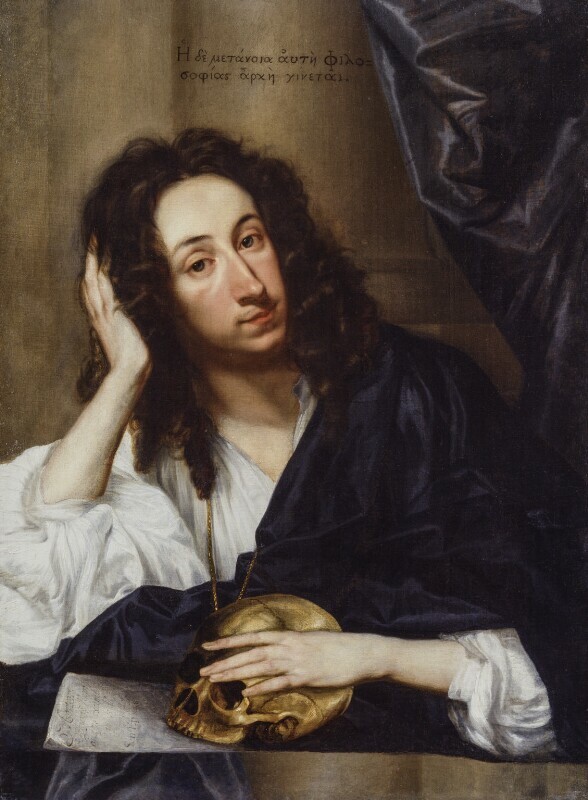 Evelyn records in his Diary that he sat to Walker on 1 July 1648, and that his portrait was intended to accompany a treatise on marriage which he had written for his young wife Mary Browne. The portrait originally showed him holding a miniature or medal of his wife. The skull was substituted some years later, with the Greek motto (top) signifying: 'Repentance is the beginning of Wisdom', and the quotation in Latin from Seneca on the importance of preparing for death. Resurgence of civil war largely ends at the battle of Preston, won by Parliamentarians under Oliver Cromwell's command. Parliamentary General Henry Ireton's Army Remonstrance demands the king is tried an enemy of the state. Ireton also instigates a coups d'état, Pride's Purge, ridding Parliament of MPs supporting negotiations with Charles. John Wilkins, Bishop of Chester, publishes Mathematical Magick, the first work in English on the fundamental principles of mechanics, conceived in the form of a practical manual. A series of European treaties, negotiated since 1644, results in the Peace of Westphalia and ends the German phase of the Thirty Years' War, and war between the Dutch and Spain in the Eighty Years' War. Delegations are sent from around Europe, Henri II d'Orleans leads the French delegation.